I was completely inspired by Jessica's tutorial over on How About Orange last week. Check it out here. She cleverly showed how to make a bag out of an envelope. I literally grabbed an envelope while I read her post and tried it. It works beautifully! 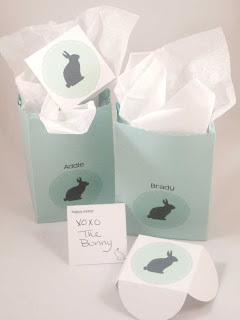 I started thinking about how I could use this idea and Easter goodies came to mind. Here's what I came up with. I thought I'd share. I'm going to put some candy in the bags and give to my kids for Easter. I had to use tissue for the photo because if I bought Easter candy now, I'd eat it all before Easter. No lie. After you've looked at Jessica's tutorial, download this PDF template formatted for an A2 envelope. You CAN CHANGE THE NAME in the template and print it out. Just open the PDF in Acrobat 8 or later (download for free at www.adobe.com), click in the text box and type your info. I printed on light blue envelopes. If you're using a different size envelope or a store-bought bag, print the pdf on paper, cut and glue to your bag. Label paper would work too. You can also download this PDF template of a 2" square envelope and coordinating card. You'll need a color printer, 8.5x11 card stock and scissors. No glue needed. The envelope folds to interlock in the back. So simple. You don't have use the card with the bag. Tuck one in a bouquet of flowers or at place settings and write trivia questions on them. If you don't want your card to say "happy easter", cut 2" squares from any paper and write your note. Have fun and leave a comment on how you'll use these freebies! Thanks Jessica for the inspiration! I love those. Thanks for the free downloads. That's neat that you can change the name in Adobe!